Sketch #62- Hangin' Out with my Ghoulfriends! It's that time of the week and hope you can play with this weeks sketch. For this sketch, I used another stamp sitting alone on my desk wanting to be inked up. This is MFT's Totally Witchin'. It is so cute and a fun Halloween set. I used some new mat paper from K&CO I picked up and some new ribbon. For the main image, I colored it in with Copics and sponged the background in Barely Banana. The sketch calls for some scalloped edges, but I thought it would be more fitting to match the jagged edges of the 'ghouls' dress, so I used some decorative scissor and added some white gel pen to the ends. I popped up the main image and sentiment on diamensionals. The white "brads" are self adhesive white metal dots. This was a fun one to make!! Thanks so much for taking a peek! Hi everyone!! I hope you all had a great weekend! Mine was busy as usual catching up on things that didn't get finished during the week. I am trying to get back into do the daily challenges on SCS and todays Try a New Technique was using glitter on a background. Now, this is not really a "new" technique but certainly one that not too many people use. Glitter is so messy and well, glittery! Definitely something to do while the kiddos are in school! 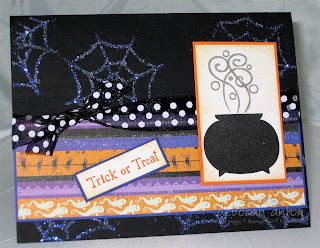 For my card, I used my MFT set called Totally Witchin'. I stamped the web as my background using heat and stick powder and then added my glitter. I picked up some new K&Co. paper this weekend and used that on the bottom with the main image of the cauldron and steam over it. I sponged over the main image with distressing ink to set back the bright white. I added a sentiment from Rubber Soul, some ribbon, and then went over the steam with a glitter pen for more added sparkle. The main image and sentiment are popped up. Just a quick and simple card to start off the week. Thanks for stopping by and taking a peek! It is a fun sketch and gives some room for improvisation. Of course, that is what I did a bit! LOL!! I used the new MFT set called We're not Scared. It is so fun and cute!! The DP is from the Fall Mat stack of DCWV. I colored in the shirt to match the dp using my Copics and the scarecrow himself. For the bg panels I used my new CB folder of Branches which I then sponged on top with Tim Holtz Distressing ink in Antique Linen. I cut out the main image to place on top with diamensionals. The little owls are darling and I cute those out as well and popped them up. I added ribbon using Holly's (TOY) "easy peasy" bow. Added a sentiment from SU! Fancy Flexible phrases and for a but of sparkle, I used my Shimmerz in Barn Red along the edge of the card and on the shirt of the scarecrow. I hope you can play this sketch and have fun!! Thanks for stopping by!! 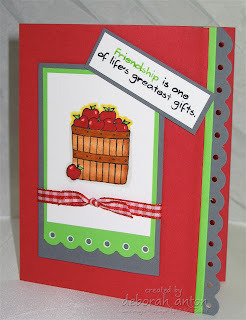 This card was made for todays Sketch challenge on SCS. This is another new set that was screaming for some ink and I was happy to oblige. : ) This set is called Nature Calls from MFT. 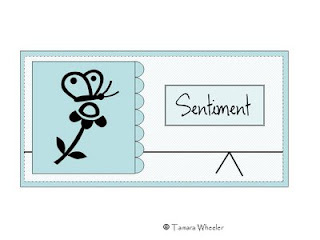 There is a fun sentiment set to match it called What's your sign. That is where this sentiment is from. I colored the main image with Copics and cut out the top part of the image off the paper. I popped it up on diamensionals and stamped the tree randomly on the top strip. I then cut the bottom of that strip with some decorative scissors. The little sign is a brad I picked up at the Eyelet Outlet booth when I was at CHA. The bottom part of the image was sponged in for grass. I added some ribbon and here he is! I feel like he needs a name... maybe Earl? Does he look like an Earl? Hmmm... something to ponder about.... Thanks for taking a peek! Color Challenge and a quickie! I made this card for the Color Challenge on SCS. The colors are Riding Hood Red, Basic Grey, and Green Galore. I'll tell you what... that green just throws me off!! But it's a relatively nice combination. I once again used Whimsical Autumn by Carolyn King which you can find here at Gina K. Don't forget that Carolyn is donating 100% of her proceeds to the Alzheimer's Association. 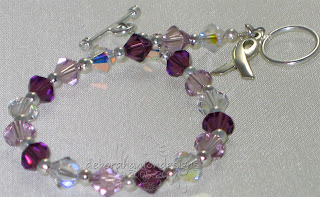 In addition to that, I am donating $5.00 of every Alzheimer's Support bracelet sold. You can find the deets here. The main image was colored with Copics and put on dimensionals. 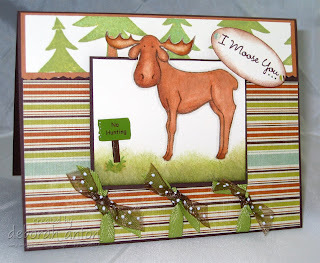 I used the Fiskars Water Threading punch, (which you can also find at Gina K) for the bottom of the main image and the side of the card. I added some ribbon and I was done! Materials Used: SU! Riding Hood red, Green Galore, Basic Grey, White,Copic Markers, Threading Water Punch, Whimsical Autumn, Green Galore marker, Basic Black marker, Palette Noir, white gel pen, diamensionals, and ribbon. For this card, I wanted to knock out something quick. I love this flower from Flourishes from the set Thank you. 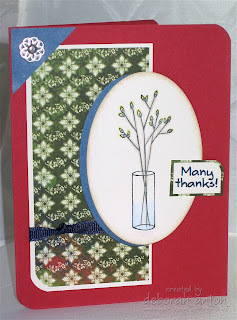 I embossed the card and small panels with the Swiss Dots folder and added some white. I wanted the flower to be the main image, so I used my Petite Oval nesties for the center panel while sponging some color on both ovals to give an edge on each. This is done while the paper is still in the die. One thing you can't see is that I added some Shimmerz in Angel Wings to the flower for some sparkle. 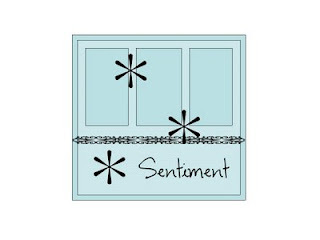 I popped up the image and ovals and added some ribbon and sentiment. As always, thanks for stopping by! My good friend Carolyn, AKA Cammie, released her new set with Gina K. called Whimsical Autumn. She is donating her proceeds from the sales of this set to the Alzheimer's Association in memory of her grandmother who recently passed away from this disease. I am big supporter of research for diseases that millions of Americans die from each year. I really try to do my part and I am a big supporter of the American Cancer Society. My father passed away from Cancer when I was just 7 and this is certainly a disease that can use more and more research. However, Alzheimer's affects so many year after year with no way of controlling the spread or the reason for contracting this disease. My DH's grandfather passed away from it 8 years ago after many years battling it. You all know I love to bead as well as stamp (hence my name) so I wanted to help out my good friend with her cause in donating some money to the Alzheimer's Association. 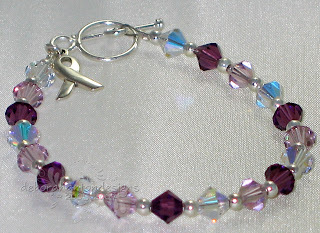 I have created an Amethyst and Sterling Silver Swarovski Crystal bracelet that I am selling, (Amethyst is the color in support of Alzheimer's) and will be donating $5.00 from each sale to the association! The picture is below. This bracelet can be worn everyday as a reminder that you have helped better the research of this disease! It is simply designed in Amethyst, Light Amethyst, and Crystal AB Swarovski Crystals, sterling silver beads, and is finished with a sterling silver toggle clasp and an optional awareness charm. You can order in three different sizes: 7", 7.25", 7.5", and 8". The price is $20.00 without the charm and $22.00 with the charm. Shipping is a flat rate cost of $3.00 for the United States and Canada. International buyers: I will email you the cost of shipping. If you are interested in purchasing a bracelet, please click the Paypal Button of your choice on the side panel. I will begin your custom bracelet when payment is received and will be shipped out within 24-48 hours. Thank you all in advance for your support and if this bracelet is not for you, then I hope you can purchase this new stamp set of Carolyn's! You can find this set and all the others she has designed at Gina K Designs. I was trying to spend this weekend in catching up on challenges on SCS among other things. I have been MIA for some time now, that I really need to get posting and commenting. I started off my list with the Gina K's Sketch challenge that you can find here. I used my new set by Carolyn King called Whimsical Autumn. For those of you who may not know, Carolyn is donating 100% of her proceeds to the Alzheimer's Association in her grandmothers memory. How cool is that??!! You can find more deets on her blog. Not only is it a versatile set and fun, but it is for a good cause! I hope you head to Gina K's site to purchase this fabulous set and help support a good cause. 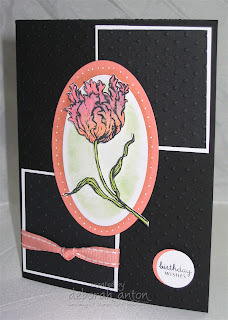 For this card, I whipped out my Prismacolor Pencils and Gina K Mineral Sprits for a softer look on the flowers. I also used Basic Grey's Boxer paper and SU! new In color. I also utilized the new SU! decorative brads which I think are so fun and cut out my oval using my Nestibilities in Petite Ovals. This is a great sketch, so play along!! 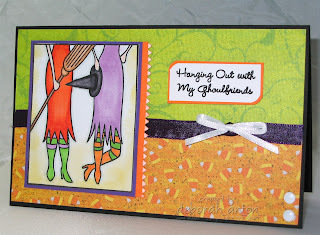 Here is another card I made for the Gina K sketch challenge also using Carolyn's new set. The dp was a sample piece I picked up while at CHA from October Afternoon. It is just so cute and for some reason, it was calling me to use it! : ) I kept the main oval simple so not to make it too busy since the dp has a bit going on. 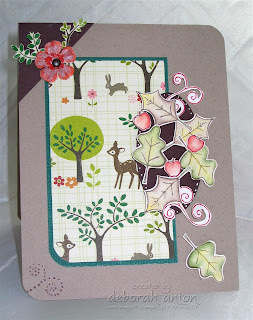 From the stamp set, I used the leaves, apples, and swirls. I added a prima flower which I colored in using both Copics and Shimmerz in Barn Red. Speaking of Shimmerz... have you tried it?? They are so much fun and can be found here at Jackonbelle Embellishments! For the pierced swirl on the bottom- I stamped one of the swirls on scratch paper and used that as my template to pierce. I then dotted them with a deep red gel pen which I think I probably shouldn't have. But it's done! Everything is on diamensionals. Thanks so much for stopping by and taking a peek!! This is Sketch #60 on Sketches! by Tamara. Check it out here! 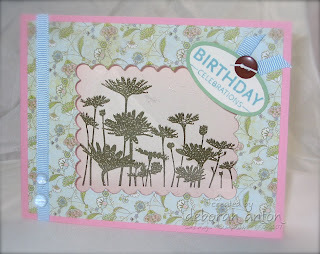 I just love Basic Grey's Periphery collection and decided to use snipets from the paper set. I took the cover page where it shows a bit of each paper and cut out the strips. That is what I used for my bg. For the main image, I used some glossy paper which I colored with some Copics by blending three different colors and used a technique that was called in the class I took, "Nasty Rag." (I know, could be called a better name...) This technique gives some diamension to your image, but for this, I used a sponge instead for a different look! LOL!! The sponge gave it more of a marbled look but I liked it. I then stamped the image with Versamark and embossed it in copper. I used my Threading Water punch by Fiskars for the middle panel and distressed all edges. 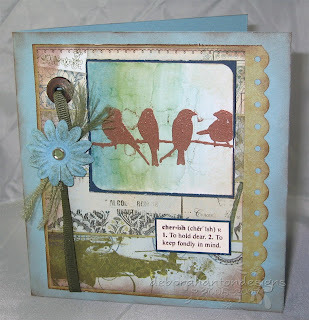 I then sponged the outerlayers and a little on the main image using Tim Holtz distressing ink and some SU! Close to Cocoa. I also sponged the Prima with some Always Artichoke to tone down the blue and frayed the ribbon ends. I hope you all stop by Sketches! By Tamara to play!! Thanks for stopping by and taking a peek! Trying out the new Schtuff! You know... moving stinks! But in the same breath, I can say it's like Christmas for me! I had gotten a few new things prior to the move, while in the moving process, and of course after it's all said and done. So, I have quite a bit to play with and try out. One of the new "toys" I got was a Bind-it-All. (This would be in the after-it-was-all-said-and-done category) This was an item I really wasn't sure if it was a 'must have.' But now that I have it, I love it!!! It's just really fun to create with it! This is the first item I made and it's for my sister who is getting married in November. I created this To Do and Weekly checklist that I thought she could use whilst planning and traveling between home (Switzerland) and where the wedding will be held. (The Netherlands) Nothing fancy, but just something she can chicken scratch in. I purchased the new SU! set of It's a Plan which I stamped, cut to size and filled the inside with. While I was at CHA this summer, I came across the Amanda Blu (AB) booth showing off their line of self adhesive glass tiles. They were pretty cool. Well, I came across those the other day in a $1.99 bin! There is a 7"x7" set inside each package and thought it would be cool to make the entire cover of this book with them. So easy to use! It would also be really neat to buy various colors and collage them together. I used Papertrey's set of Out on a Limb for the outside and used ribbons and rhinestones for embellishments. Again, nothing fancy, but trying out my new stuff!! Thanks for taking a peek!! 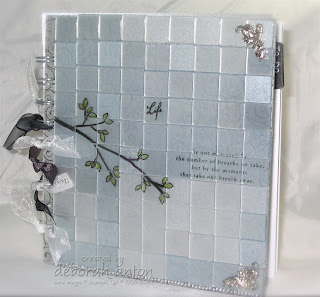 Materials used: Zutter acrylic covers, wires, and bind-it-all, AB glass tiles, SU! It's a plan, Tab punch, metal embellishments, Papertrey Ink, ribbon, self-adhesive rhinestones. Another item I got (finally!) was Nestibilities. (This falls into the Prior-to-the-move catergory) For this card, I cut out the front with my large nestie and placed a transparency inbetween. The image was stamped on the inside and then embossed. I added some ribbon, a sentiment, embellishments and I was done. Just another quick item. Thanks for stopping by!! Football season is getting started and I found these fun little picks in the Target dollar bin. 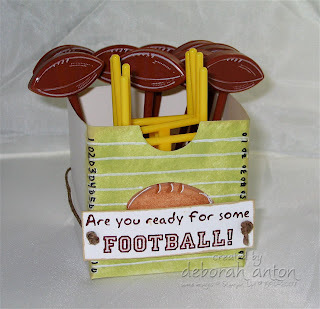 I thought it would be fun to create a holder for them and set them out for the next gathering of a big game. I made the box to look like a football field and the goal to sit in the background. I used Gina K's set of Your Tailgate or mine for the sentiment and filled the inside with rice to hold the picks in place. Quick and simple with no frills- Just what the guys like! Thanks for peeking! Hi everyone!! I hope you all had a great Labor Day weekend. My family and I spent it in Virginia and had a really nice time. I apologize for the day late on announcing the Blog Candy winner, but we have one!! SENA!! Come on down...!! Please email me your snail mail and I will get that out to you! Congratulations to you and thank you to everyone who shared their input on storage solutions! **Don't forget to stop by Sketches! 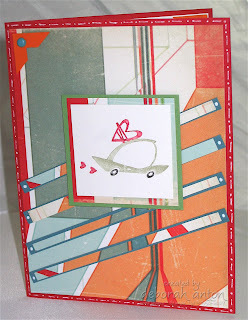 by Tamara Thursday for a fun card sketch layout! 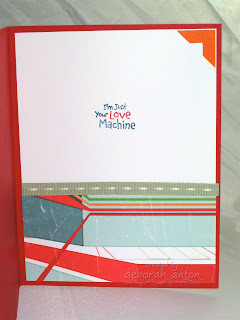 If you like to scrapbook, check out her sketch this week for that! !